Marlborough may have made its reputation on Sauvignon Blanc, but the region’s Pinot Noirs are certainly well worth the attention they are receiving. 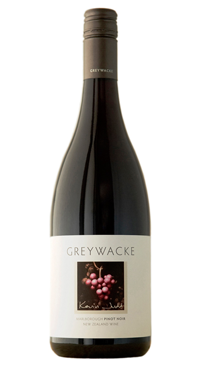 Kevin Judd, long-time head winemaker at Cloudy Bay, creates the wines under this Greywacke label. Greywacke (pronounced “Gray-wacky”) is a type of soil found throughout New Zealand made up of gray sandstone, clay and coarse grained particles providing good drainage. Much of the fruit Judd sources throughout Marlborough grows on such soil. All fruit was grown in Marlborough’s Southern Valleys and principally sourced from the Yarrum Vineyard situated on the Brancott / Ben Morven ridge. Typical of this sub-region, the wind-blown loess soils are comprised of clay-loams with differing degrees of gravel content. The various source blocks are cultivated to a mixture of pinot noir clones. The grapes were hand-harvested and chilled overnight prior to hand sorting. Most of the fruit was then de-stemmed into open-top fermenters, the majority of which also had a percentage of whole-bunch inclusion. The fruit was left to soak on skins prior to the onset of indigenous yeast fermentation, then plunged daily. After fermentation the wine was pressed, racked and filled to French oak barriques (40% new). Individual clones were separately aged in barrel for 18 months, prior to blending in December. Once in tank the wine was lightly egg white fined prior to bottling in March. A virtual compote loaded with black plums, boysenberries and redcurrants lightly infused with cinnamon and cloves. An intensely perfumed Marlborough Pinot with fruit sweetness, floral highlights and a distinct smoky and slight gamey fragrance. The full-flavoured palate has dark fruit richness with great length as well as freshness.